Cedar Springs Police Chief Roger Parent spoke to the Cedar Springs Area Chamber Commerce Monday evening about the robberies that took place last month and ways and things business owners should do if one occurs. 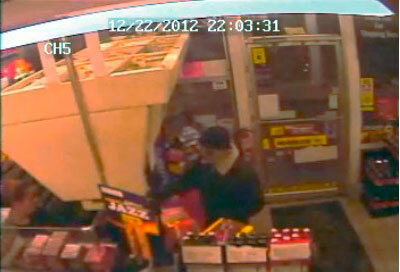 The first robbery occurred on October at the Admiral gas station, on October 9, at about 9:20 p.m. It was robbed again on December 22, about 9:02 p.m. Then, on December 29, the Kent Theatre was robbed at about 10 p.m. In each case, a man with a mask pulled over his face implied he had a weapon and demanded money, and then fled on foot to the east side of town. Two days later, on December 31, New Year’s Eve, Family Video was robbed at about 9:50 p.m. A man in dark hair and dark clothing walked around the store for about 20 minutes without a mask waiting for others to leave, then pulled a stocking cap down over his face with eye holes cut out and approached the counter. 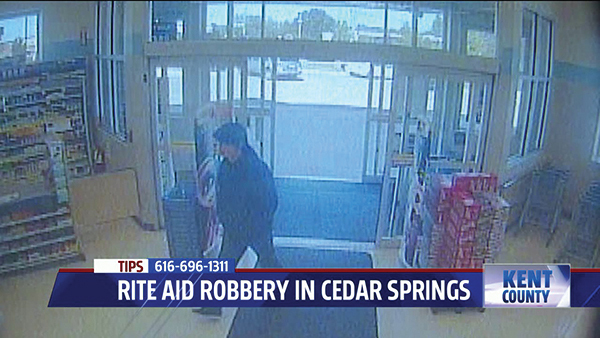 He showed the clerks a 5 or 6 inch hunting knife and demanded money. He then walked away to the west, towards Second St. He was tracked to Beech and Second Street, where the scent disappeared. Each time the clothing has been different, but he has been described as about 5 foot 8 inches, and somewhere between 165 to 200 pounds. Chief Parent urged residents to report any suspicious activity, such as a car parked and idling in a spot where it normally wouldn’t be, and if they see a crime, to be a good witness. “Look for scars, tattoos, the type of clothing they wear,” he said. Anyone with information should please call the Cedar Springs Police a 616-696-1311, or Silent Observer at 616-774-2345. The Greenville Department of Public Safety is asking for assistance from the public regarding information that would lead to the identification, arrest and prosecution of those involved in recent criminal activity in the city of Greenville. The department is looking for the individual(s) responsible for the Huntington Bank Robbery, Huch’s Jewelry larceny, and the Family Dollar robbery. The Huntington Bank in Greenville was robbed about 10:34 a.m. Wednesday, November 9. The male suspect is described as 6-foot to 6-foot 3 inches, medium build wearing light colored blue jeans, black shoes, blue coat with black and white stripes in a plaid pattern, blue knit mask with no holes visible, and a dark winter type cap with flaps. The suspect produced a dark colored handgun and left the bank in an easterly direction on foot. He got away with an undisclosed amount of money. The larceny at Huchs Jewelry happened November 29, at about 1:30 p.m. A white male, 5’11, 200 pounds, with dark hair, and a 2-day growth of beard, entered Huch’s Jewelers in downtown Greenville and was looking at items. The subject then distracted the employee, grabbed the items off the counter and fled on foot out the back door through the alley. He was last seen northbound in the alley. He was wearing a black under armour hat with a white logo, and a dark colored light winter jacket with a red, hooded sweatshirt underneath. The Family Dollar Store in Greenville was robbed on Thursday, January 5, about 8:30 p.m. A robber walked in with a handgun and demanded cash. Employees emptied the cash register for the robber and then fled to a back room, where they called police. 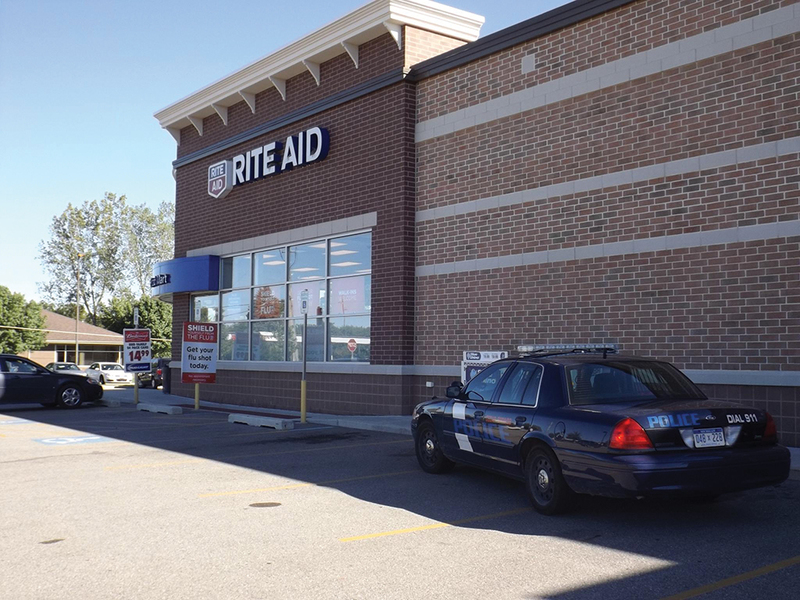 The robber was described as a man about six feet tall, 170 pounds with a mustache, green gloves, black boots, jeans and a plaid grey hoodie, with a white hood. The suspect was also wearing a ski mask. If you have any information please contact Detective Aniszko at the Greenville Department of Public Safety at 754-9161. Detectives with the Kent County Sheriff Department have arrested Michael Scott Houston, 37, from Rockford, in connection with recent armed robberies. Investigators were able to match a face on surveillance footage with a name they got through a tip from Silent Observer. Houston, who is currently on parole for armed robbery, was arrested on Friday, December 9, by Sheriff Dept. Investigators. Detectives believe Houston, who is charged with holding up the Clark Gas Station on 28th St. in Cascade Twp, on November 29, may also have robbed a Shell Gas Station in Grand Rapids. Detectives from both agencies are working together on these separate robberies. Houston has been charged with Armed Robbery, Felony Firearm, Felony Larceny and a Parole Detainer and is being held on a $95,000 bond.